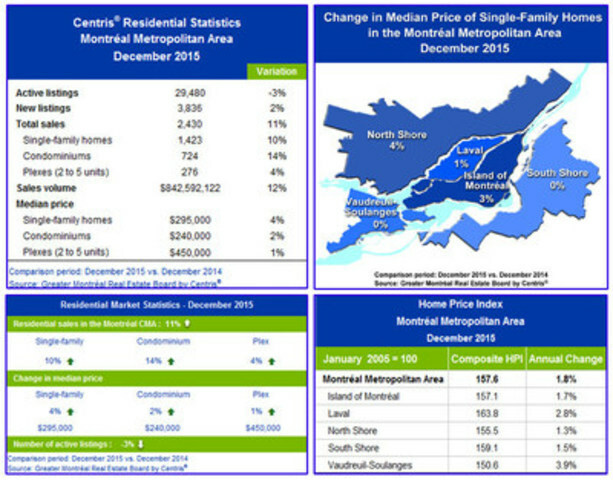 L'ÎLE-DES-SŒURS, QC, Jan. 7, 2016 /CNW Telbec/ - The Greater Montréal Real Estate Board (GMREB) has just released its most recent residential real estate market statistics for the Montréal Census Metropolitan Area (CMA), based on the real estate brokers' Centris® provincial database. In total, 2,430 residential sales were concluded in December 2015, an 11 per cent increase compared to December 2014. This was the tenth consecutive monthly increase in sales and the most active month of December in four years. Click here to watch the December 2015 statistics video. The South Shore registered the largest increase in sales in December, jumping by 22 per cent compared to December 2014. Laval and the Island of Montréal also enjoyed a more active month of December compared to December 2014, posting respective sales increases of 15 per cent and 12 per cent. On the North Shore, the number of transactions remained stable compared to December 2014, while Vaudreuil-Soulanges registered a 12 per cent decrease in sales. Condominium sales across the Montréal CMA rose by 14 per cent in December, the largest monthly increase in 2015. Single-family home sales grew by 10 per cent, thanks to significant increases on the Island of Montréal (20 per cent) and on the South Shore (19 per cent). Plex sales also increased, rising by 4 per cent compared to December 2014. For the CMA as a whole, the median price of single-family homes reached $295,000, a 4 per cent increase compared to December 2014. The median price of condominiums rose by 2 per cent to reach $240,000. The increase in the median price of plexes ($450,000) was limited to only 1 per cent. "The sustained increase in demand for single-family homes, coupled with the decrease in supply that we've seen in recent months, means that market conditions are once again starting to favour sellers in several neighbourhoods on the Island of Montréal," said Daniel Dagenais, President of the GMREB Board of Directors. For a third consecutive month, there was a decrease in the number of properties for sale on the real estate brokers' Centris® system, falling by 3 per cent in December. The Greater Montréal Real Estate Board is a non-profit organization with more than 9,300 members: real estate brokers. Its mission is to actively promote and protect its members' professional and business interests in order for them to successfully meet their business objectives. Centris.ca is Québec's real estate industry website for consumers, grouping all properties for sale by a real estate broker under the same address. Centris®, a division of the Greater Montréal Real Estate Board, offers technology resources exclusively to Québec's 12 real estate boards and their 13,000 real estate brokers. For December 2015 statistics charts, click here. Cumulative statistics for 2015 will be revealed on January 14 as part of the Fenêtre sur le Marché conference.